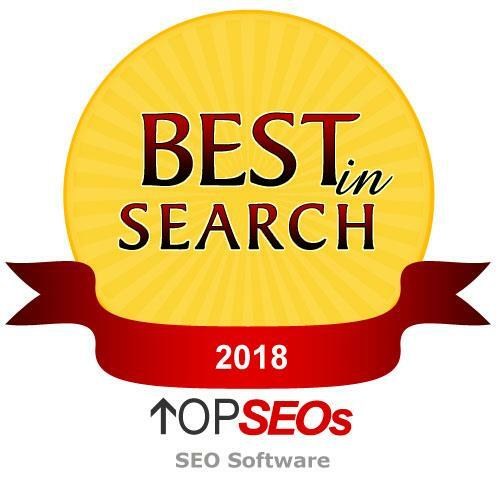 TOPSEOs, an independent authority on software vendors and services providers, has rated SE Ranking – an all-in-one marketing platform for businesses and agencies, among the top products for search engine optimization and keyword rankings which earned the platform a badge – the “Best in Search” SEO Software in 2018. During SEO software analysis, topseos spends time analyzing the accuracy of information obtained through the software and the channels and methods used to obtain data. SEO software analysis ensures the benefits of the software are produced through the most efficient method available. The analysis hones in on how well the interface caters to both experienced and new users by providing a level of customization while also providing standardization which meets the guides and tutorials produced. The analysis determines what types of features are available in the software and how useful they are to the end user. The analysis ensures the recommended vendors are able to identify issues and alleviate them in a fair amount of time. “We are very proud of the results of this evaluation as it confirms our development strategy based," says SE Ranking’s CEO Valeriy Kurilov. "Being featured in the TOP 10 Best SEO Software and Tools rating recognizes both users' and digital marketing specialists' appreciation and loyalty”. TOPSEOs releases its rankings on a monthly basis in order to account for new developments and any new players on the market which may be producing exceptional online marketing services or tools. As a result, they ensure the vendors and service providers that are featured for the current month are truly the best. The evaluation and the ratings are being updated on the monthly basis to provide the most up to date information for buyers. SE Ranking is an all-in-one cloud-based SEO platform for business owners, SEO and online marketing professionals and digital agencies that provide a complete set of tools for comprehensive site audit, competitor analysis, website ranking, keyword suggestion and grouping, backlink monitoring, automated professional reporting, and much more. Besides standard SEO tools the system offers a set of additional features such as White Label and Marketing Plan aimed at helping you achieve your strategic marketing goals faster and more effectively. All on one platform within the same user-friendly interface. Since its introduction in 2002, TOPSEOs has been identified as an independent authority on vendors who supply internet marketing products and services. Our mission is to offer comprehensive and independent advice to assist buyers in making purchasing decisions from internet marketing vendors.